I ordered a 450 barrel made by XXtreme Barrels. It’s an 18” mid gas heavy profile that’s been cryo treated, 1-24 twist. I’m on a tight budget with this upper, and got this barrel at a good price. Specs look good, but I’ve never owned this brand before. Anyone have experience with XXtreme barrels? First I've heard of them, have a link to them?? Al in Mi wrote: Welcome. Haven’t figured out how to post a link, but it came from Delta Team Tactical. Cheap enough to try. Bear Creek and GLFA had some about the same price, couple fellas here had good luck with them. Al in Mi wrote: Cheap enough to try. Bear Creek and GLFA had some about the same price, couple fellas here had good luck with them. I surely will. Got a Toolcraft BCG on the way too. Also have an Aero upper I’m going to use. I’ve read about modifying the upper for the 450, but I’d appreciate any info on how to do this mod. Like Al said, worth a try. One thing you have to pay attention to, the muzzle threads on that are listed as 5/8x32, not 11/16x24 (standard 450b). Some brakes for the 458 socom are 5/8x32, so you should have options, or get one of Ross’s brakes made for it. As to the upper, there are a few options that are hogged out for the big bores. If it can be used for 458 socom or 50 beo, it’s big enough for the 450. I think aero now makes one. You can also the route of opening up a standard one. I did one, it’s easy, just need a dremel. Hoot did a good write up on it. Bmt85 wrote: Like Al said, worth a try. 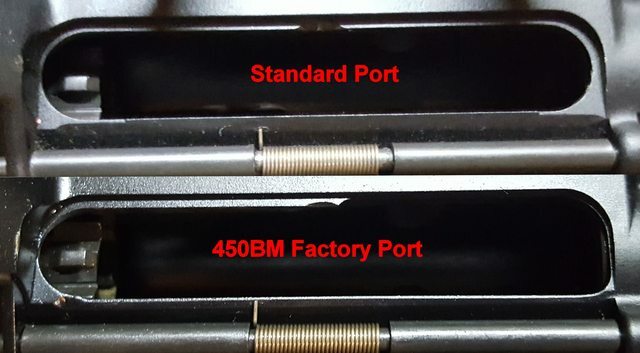 One thing you have to pay attention to, the muzzle threads on that are listed as 5/8x32, not 11/16x24 (standard 450b). Some brakes for the 458 socom are 5/8x32, so you should have options, or get one of Ross’s brakes made for it. Thanks for the advice! Where can I the write up on opening the upper? 303hunter wrote: Thanks for the advice! Where can I the write up on opening the upper? Not one of my overly wordy write-ups but a picture is worth a thousand words. Here's a better side by side image, illustrating what needs to be enlarged.